Nothing can be more scary than seeing a beloved pet have a seizure. Seizures usually come out of the blue and one feels utterly helpless as the minutes tick by. Today, we’re going to discuss what causes seizures and what to do when your pet has one. 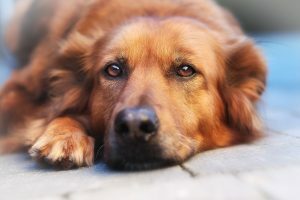 A seizure, otherwise known as a fit, is often characterised by the animal falling over onto one side, becoming stiff legged or paddling their legs and is accompanied by salivation, urination or defaecation, vomiting and vocalisation. The pet is unconscious during this time and won’t respond or calm down if you hold it or talk to it. Often the seizure lasts anything from 30 seconds to 5 minutes although it can feel like hours. Seizures can be confused with fainting – which can look very similar except that the dog or cat lies still during the unconscious time if they have fainted. They can sometimes have partial seizures that are more difficult to recognise. They may look dazed and unresponsive for a short time or start chasing their tails or biting at imaginary flies. If your pet displays these symptoms they should also be evaluated by a vet. What should you do if your pet has a seizure? Try and keep the pet safe by moving it away from any area where it might hurt itself (stairs or swimming pool). You can put cushions around your pet so that they won’t injure themselves. DO NOT put your hand in your pet’s mouth. They cannot swallow their tongues and you will end up being bitten if you do so. Try to time the seizure (the vet will ask you how long the seizure lasted). Try to notice the colour of the dog or cat’s tongue without putting your hand in the pet’s mouth (pink or blue, as this will help the vet to differentiate between seizures and fainting). Phone the vet immediately after the seizure for advice. If your pet has multiple seizures in a period of a few minutes or if they last longer than 5 minutes take them to the vet immediately. There are many causes of seizures. The first thing the vet will do is establish whether poisoning could play a role as this requires immediate action. Thereafter they will rule out conditions that originate outside of the brain that can cause seizures, e.g. low or high blood sugar, electrolyte imbalances, liver or kidney failure, by doing blood tests. If the blood tests are abnormal, further tests including ultrasound or X-rays may be required. If the blood tests are normal then the cause of the seizures originates in the brain and this would include idiopathic epilepsy, brain tumours, congenital brain abnormalities (e.g. hydrocephalus) and meningitis. Often, further tests including MRI and spinal taps are required to differentiate between these causes. Your vet will first stabilise the dog and stop the seizures using medication. Once the underlying cause has been established they will then prescribe appropriate treatment for the cause. The pet may be hospitalised or referred to a 24 hour facility to watch for seizures until they are stable on the medication. What is idiopathic epilepsy and what to expect? This is the most common cause of seizures apart from poisoning in dogs and cats. It is quite similar to epilepsy in humans. Dogs with epilepsy will usually have their first seizure from 6 months – 5 years of age. Dogs that are predisposed to epilepsy include Beagles, Labrador Retrievers, Vizslas and Golden Retrievers. 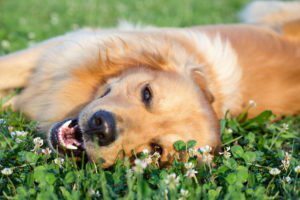 Most dogs will start with a seizure here and there which will increase in frequency with time, but some dogs will start with multiple seizures on one day. In most cases, epilepsy can be managed and controlled well using various medications. The vet will rule out all the other causes of seizures before starting medication. Once your pet is on medication they will need to be seen every 3-6 months by the vet to assess their general health, the medication levels and to screen for side effects. The goal of treatment is to reduce the number of seizures to less than one seizure every 2-3 months, and that doesn’t last longer than 5 minutes at a time. Thus, your pet may still have a seizure from time to time but they shouldn’t occur frequently. You will be given extra medication to give your pet when he/she has a seizure in order to stop it quickly and to prevent further seizures that day (also known as cluster seizures). Seizures often occur at night, when the pet is sleeping and with time you may be able to recognise the signs prior to the seizure starting (also known as the aura). These signs may include restlessness and whining. If you have another pet, they may also start looking restless because they can often pick up the symptoms earlier than what we can. If you recognise the signs you can give the extra medication that the vet prescribes to stop the seizure before it even starts. Epileptic patients can live long and happy lives if you walk in partnership with your veterinarian to tailor and manage their treatment.